HP was one out of four vendors with day one VVol suppor with their high-end flash optimized storage 3PAR StoreServ. The HP XP7 Storage supports VVOLs since microcode version 80-03 which has been released in September 2015. IBM was one out of four vendors that offers hardware with day one VVol support. Their XIV Storage System and the IBM SAN Volume Controller (SVC) is currently supported for VVol. While XIV offers first day support, SAN Volume Controller release V7.6, which supports VVol was released in November 2015. NEC was one out of four vendors with day one VVol support. Their M-Series Storage Disk Arrays offers scalability and performance from low-end to high-end environments. SANBlaze was one out of four vendors with day one VVol support. It's not a common storage vendor, but a pioneer in storage emulation solutions. SANBlaze VirtuaLUN target emulation systems are available as physical appliance or as virtual appliance. NetApp was the 5th vendor that appeared in VMwares HCL to support VVols. NetApp was a very early VVol adopter and the only vendor that had a virtual Clustered Data ONTAP simulators available for customers, to set up a virtual environment and try VVols. A NetApp V-Series is also available with VVol support. EMC VMAX3 storage systems are listed in VMwares HCL since December. Dell offers VVol support for their EqualLogic PS storage systems with firmware release 8.0. Curently there are 51 systems listed in VMwares HCL. Hitachi offers VVol support for their Virtual Storage Platform and for their NAS 4000 Series. Atlantis offers VVol support for their Atlantis USX serives. Fujitsu offers VVOL support for their ETERNUS DX storage platform. NexGen offers VVOL support for their N5 Hybrid Flash Array. Huawei offers VVOL support for their OcenStor Unified Enterprise-Storage systems. DataCore offers VVOL support for their SANsymphony-V Storage Virtualization solution. Version 10 PSP4 which supports VVOL was released in November. 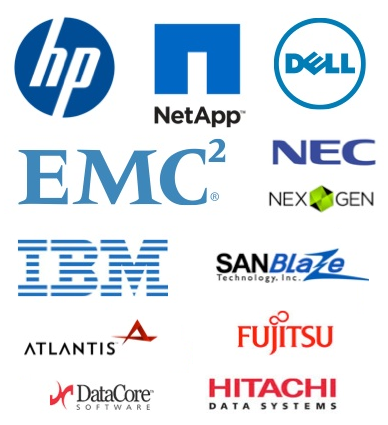 DataCore is very special because it brings VVol support to all storage arrays from all vendors behind DataCore. At the moment Tintri is not listed in VMwares HCL. Tintri has announced support for vSphere 6. At the moment Nimble Storage is not listed in VMwares HCL. Nimble Storage has announce support for VVols and proved their capabilities with Hands-on Labs during VMworld. They state that all arrays will be supported with VVOLs. Currently VVOL is available as "Tech Preview" in NimbleOS 2.3. At the moment there is no VVol support from SolidFire. They announced VVol support for their products and provided a technical demonstration. At the moment there is no VVol support for Pure Storage arrays. They announced VVol support for their FA-400 series flash arrays. Feel free to comment or contact me when there is any misinformation, or there are any vendors missing. Thanks for the info. A comment about the NetApp support, although VVol support has always been there for quite some time, even now Q1/2016 you would never run this in a production environment. The VASA provider is of critical importance from an availablity perspective when running VVols and unfortunately the VASA provider for NetApp is offbox and has no HA capabilities meanings its a big single point of failure in any environment.